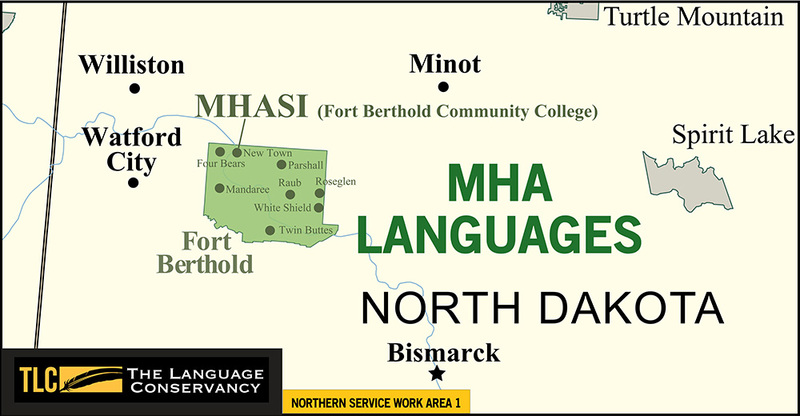 MHA Language Project – Hidatsa is a project of MHA Nation Tribal Education Department, Nueta Hidatsa Sahnish College, NHSC Native American Studies Department and The Language Conservancy. The project aims to create as many new fluent speakers of Hidatsa as possible using best-practice solutions such as effective teacher training, creation of teaching materials and resources, engaging youth in speaking the language, providing assessment testing, and building apps and multimedia projects. MHA languages are in in need of support: the average age of fluent speakers is 65 and older, learning materials and methods are not consistent across school systems, there are too few trained language teachers, and our advanced students’ needs are not being met. To create sequenced learning materials for all language learning levels that will move students from beginner to intermediate and advanced levels of the language in a consistent, standardized and effective way in all reservation communities. The project is designed to build local capacity for managing and developing language resources, revitalization materials and efforts. Today we are working to train, certify, and employ more language teachers in MHA Nation schools and to encourage public familiarity with written and spoken Mandan, Hidatsa, and Arikara in MHA communities. We’ve made big strides in our mission to save our languages, and are looking forward to making more progress. The success of our initiative depends on not only better learning in schools but also widespread interest and participation among our communities. This is why we hope YOU will join and support the MHA Language Project! The Three Affiliated Tribes – Mandan, Hidatsa, and Arikara – form MHA Nation. Although the three tribes have shared culture and history for a long time, each tribe keeps its own sense of identity and tribal relationships. Learn more about MHA Nation at the official tribal webpage and visit the Arikara and Mandan MHA Language Project pages.